Mapping Deepwater Areas off the Southeast U.S.
Map showing the three priority areas targeted for mapping during the expedition. Image courtesy of the NOAA Office of Ocean Exploration and Research. Download image (jpg, 1.2 MB). From October 1 to October 24, NOAA Ship Okeanos Explorer will conduct a 24-day exploratory mapping expedition to collect critical data for the U.S. Extended Continental Shelf Project. These operations will target three adjacent priority areas east of the Blake Plateau, northeast of the Bahamas. These areas were designated as high-priority areas by the U.S. Extended Continental Shelf (ECS) Project Office. 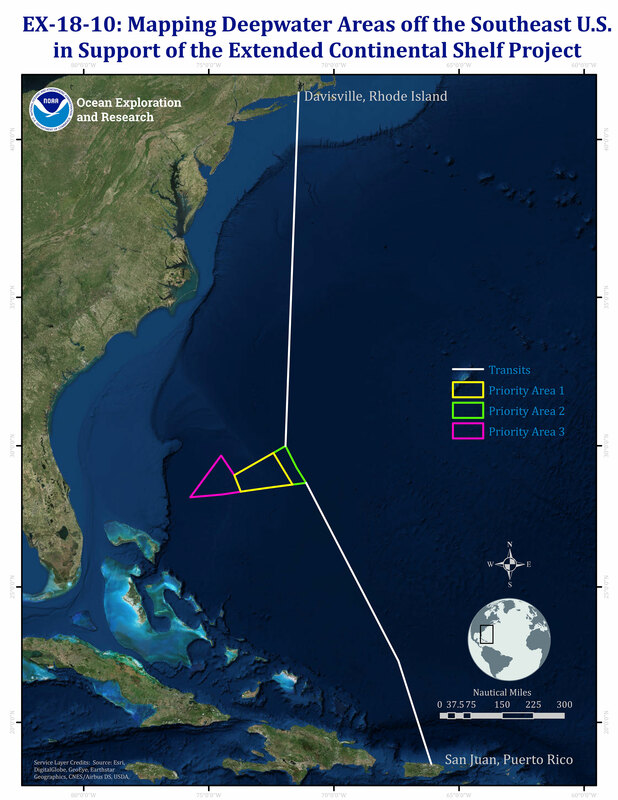 While the study area contains some publicly available transect multibeam bathymetric data, more complete coverage is required to meet the objectives of the U.S. ECS Project and boundary negotiation with the Bahamas. Exploration mapping operations will prioritize subsets of these areas that do not have any modern sonar data. 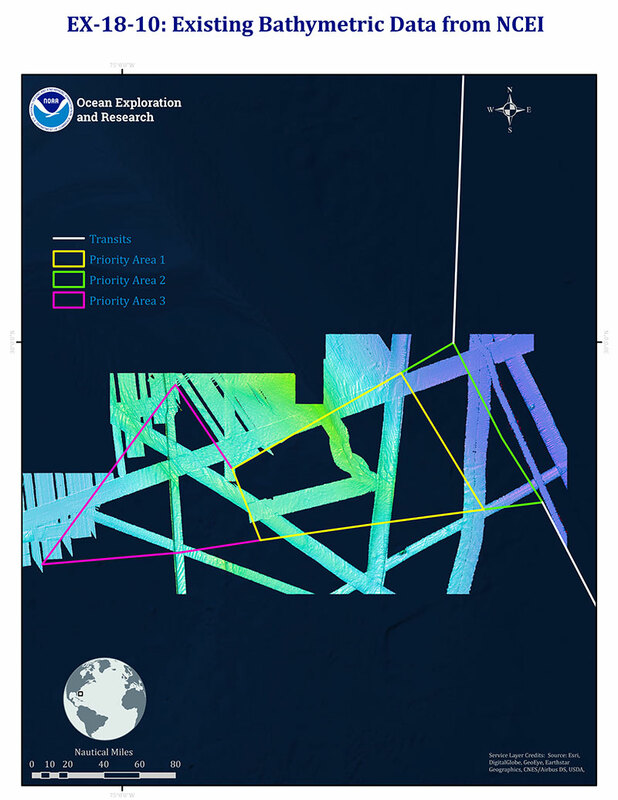 This mission aligns directly with the NOAA Office of Ocean Exploration and Research’s mission to collect publicly available, authoritative scientific data for use in making timely and informed decisions concerning the management of the seafloor. In addition to the multibeam bathymetry that will be critical for ECS studies, data collected during the expedition using the ship's sub-bottom profiler will also play an important role in understanding this poorly mapped area of seafloor and what is beneath it. Map showing existing bathymetry in the priority areas targeted for mapping during the expedition. Image courtesy of the NOAA Office of Ocean Exploration and Research. Download image (jpg, 3.7 MB). The onboard mission team will include four Explorers-in-Training—early career scientists and students who will be trained in the latest acquisition, processing, and data management techniques of the sonar systems aboard the Okeanos Explorer. The on-ship team will also consist of data managers and telecommunication engineers from the Global Foundation for Ocean Exploration , who will support ship-to-shore communications and data management. Along with the on-ship team, an onshore team will be reviewing collected mapping data as it is delivered to shore. This team will consist of advisors from the ECS Project, partners at the University of New Hampshire/Center for Coastal and Ocean Mapping , and other members of the NOAA Office of Ocean Exploration and Research Mapping Team. Upon review of the data, the onshore team, in real time, will be able to advise the on-ship mapping coordinator on where to map next as deep-sea features are revealed. The Mapping Deepwater Areas off the Southeast U.S. in Support of the Extended Continental Shelf Project expedition will begin with a shakedown of certain sonar systems aboard the Okeanos Explorer after an extended dry dock and repair period. We are excited to be back in the saddle, or in this case, back in the ocean! This expedition will be the third Okeanos Explorer expedition in support of the the Atlantic Ocean Research Alliance (AORA) Atlantic Seafloor Partnership for Integrated Research and Exploration (ASPIRE), a major multi-year, multi-national collaborative ocean exploration field program focused on raising collective knowledge and understanding of the North Atlantic Ocean. Building on the successes of the 2012-2013 Atlantic Canyons Undersea Mapping Expeditions (ACUMEN), the ASPIRE initiative will broaden its geographic focus to include more of the U.S. Atlantic and the high seas and the scope of partnerships to include federal agencies, such as the Bureau of Ocean Energy Management and the U.S. Geological Survey, as well as international partners from the European Union and Canada.